Thread: Avid Elixir 5s vs. Rs vs. CRs vs. Juicys? Hello! I've been running Avid Juicy 5s for a few years and I've been fairly pleased with them. I'm now thinking about getting some new brakes, however, to put on a project frame, and I've been looking at Avid Elixirs. Can anyone tell me what the primary differences between the Elixir Rs vs. the 5s are? I know that the Elixirs use a different master cylinder technology, upgraded pads, and better rotors from the Juicys, but are they really worth the difference? Are the Elixir 5s going to be better than my Juicy 5s? Should I just spring for some Elixir Rs? Thanks in advance for your help. Ride on! I guess here's my question: are the Elixir 5s simply knock offs of the Elixir 7s (much like the Juicy 3s were of the 7s), or do they represent a significant upgrade over my Juicy 5s? Does anyone have any experience with these brakes? I think the 5's do not have the really "swank" lever reach adjuster that the R's have. Also, the caliper and hose connections are a little different. Other than that most of what I have seen and heard is that they are identical otherwise. Elixir R and Elixir CR share the same caliper with a banjo fitting. The CR has adjustable pad contact. The R only has adjustable reach. The Elixir 5 uses the first gen Elixir R caliper that did not have a banjo fitting. The lever also forgoes the toolless reach adjustment that the R has. Performance wise... the R and CR are identical. I am inclined to believe the 5 would be too as it shares the same technology and construction. I understood the technical differences between the R and the CR, but it's good to hear that from a performance standpoint that they're very similar. It sounds like not many people have the Elixir 5s yet, and that they may be primarily an OEM brake. Sobeit. I think I might give them a shot as a decently priced alternative to the Rs. I'd love to hear from anyone who has the Elixir 5s, but this is some good info already. Thanks. That's what made me buy the Juicy 5s over the 7s a few years ago, but if I had to do it again I might go for the 7s. Adjust the reach can be useful on long days when some adjustment is nice. But really, this is a luxury, not a necessity. Interesting. Good to hear that they're comparable. Thanks for the informed viewpoint! Juicy 5's have reach adjustment, assume you mean pad contact point adjustment? For me, the pad contact point adjustment is a necessity (like symmetry in my levers). So the 5's can be reach adjusted (just takes a tool)? Good to know. I don't like white, but don't care that much. I have some Elixir R's and 2 sets of BB7's. 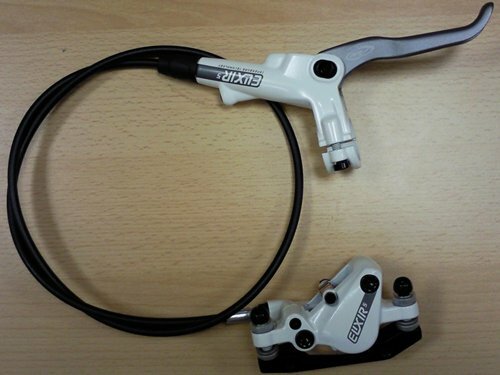 I want brakes lighter than my BB7's, but every time I ride my BB7's I just don't think its worth spending $200 on new hydro brakes like the Elixir 5's. I ended up going with the Elixir Rs over the 5s. I found a place that advertised similar prices and decided to go with the higher-level model. Setup was quick and easy. The rotors are clearly nicer than those on my Juicys, though I was a little disappointed to find them slightly out of true. I haven't been able to ride them yet other than a quick spin to bed the pads, but if I have any quibbles I'll be sure to post them. I've been thinking the same thing about the $300 I spent on Elixir CRs. BB7s work very well and are a lot easier to deal with. Has anyone had luck fitting a 90 degree fitting on the '09-10 Elixir 5? As you may know, it only comes with a non-adjustable straight fitting.